Hoping your weekend was filled with JOY! We went to see Santa Claus yesterday and two out of three girls loved him. Can you guess which little girl did not? *For only a few more days, you can get your very own set of my JOY letters in my shop. 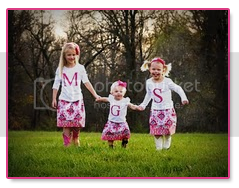 They are perfect for your cuties to wear for a fun and unique Christmas card photo!